On Thursday night I had the good fortune to stumble upon a very special television program. Charlie Rose interviewed the writer and artist Françoise Gilot and the art historian and author John Richardson. The three discussed "Picasso and Françoise Gilot: Paris-Vallauris, 1943–1953," the show on exhibit at Gagosian Gallery in New York City until June 30, 2012. Françoise Gilot met Picasso when she was 21 years old. She became his companion and muse, and the mother of their children Claude and Paloma. In addition to her major art exhibitions, Madame Gilot's books include Matisse & Picasso, A Friendship in Art and her memoir Life with Picasso. Picasso's biographer John Richardson collaborated with her to produce this exhibition which includes drawings, paintings, lithographs, sculptures and pottery by Picasso, and drawings and paintings by Madame Gilot. It is the first time that works created by both artists during their ten years together have been presented in a single show. 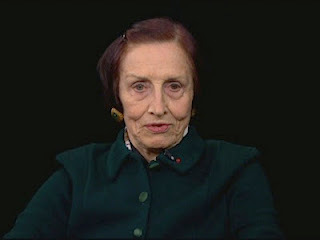 I am a longtime admirer of Françoise Gilot, but you don't have to be a fan like me to appreciate the historical and artistic significance of this interview. The program provided a rare chance to see Madame Gilot and hear her discuss her work and life with Picasso. If you missed the broadcast or would like to watch it again, the interview is available online here.